you suspend your fear for just a moment and say yes. What will you say to welcome people to your church? How do I say a welcome at church? I know, because this question and variants are common for my website and in my coaching practice. I was surprised by the number of queries asked of me, so let me give you some tips. 1. There is no magic formula to a church welcome speech. I wish I could give you a script. I’m often asked for a script. You might even be looking for sample welcome speeches to give at church. But churches are so unique, each church visitor is unique, every person who does this unique, and every worship service is unique. Even the location or timing of the greeting is so unique to every church. Some give this welcome greeting at the beginning of the service, others in the middle in relationship to their connection card, and others at the very end after the worship is over. What you will say in your welcome speech at church is dependent on lots of other variables. 2. To design a welcome speech, think like a first time church visitor. Once first time church visitors get to the sanctuary and are participating in the worship service, first time church visitors have common questions. Will I fit in here with this group of people? Is this a place where I can serve? How do I get more information about this church? Will this place help me grow in my relationship with God? Depending on where your welcome or greeting speech for visitors is located in the service, you may want to address one or two of those typical questions. Your welcome speech doesn’t have to be long at all. Most church welcome speeches start with some kind of acknowledgment or appreciation of the visitor’s presence. If you are here for the first time today, we’re glad you are here. We want to give a special welcome to our first time visitors today. We won’t make you stand up if you don’t want to . . . .
We want to give you space to be as anonymous as you want . . .
We invite you to visit the welcome center. If you’ll raise your hand, the ushers will give you a welcome packet that we’ve prepared just for you. If you’ll fill out your connection card, we’d love to send you a gift. Some move into an invitation to some volunteer mission work or connection point that is upcoming. We are building houses for Habitat this next Saturday and we invite you to come and serve with us and meet more people who might just be the ones to help you grow in your faith. This Friday, we’re having a newcomers gathering at the pastors house. Come and meet new people and get some of your questions answered. That last part is a big deal for me. I don’t know about you, but the generic “we are here to serve you” speech falls on my deaf ears. I find that the more and more I hear that, the less I pay attention. What catches my attention is the church’s mission and programming. What is your church’s unique mission and how are you expressing that in your programing in the next few weeks. We are building houses for Habitat this next Saturday and you are invited to come serve with us. You don’t need to cover every announcement every week, but pick one program expression that you want to invite people to. This is simply suggesting a next step in a first time church visitors process of connecting with your church. 5. Cover your visitor welcome speech with Prayer. As you prepare your welcome greeting, pray for your part in the service. Your part is one of many that the Lord may choose to use in helping people make another step of growth in their spiritual journey. If you are a layperson, pray that the Lord will give you the right words for that particular crowd on that particular worship service on that particular day. You might want to use these scripture verses from this list of 21 verses (or this list of 14 verses) to help guide your prayer. Never get up in front of the congregation and say, “I hope you will forgive me, I’m nervous today.” I know this seems like elementary, even trivial, advice but I have seen so many people do this. If you don’t tell people you are nervous, they will never know. I agree with what you have said except for the “v” word. They should be called GUESTS at all times. Referring to your visitiors as guests is an important part of changing both the congregation’s and guest’s view of someone who is visiting. It changes how the congregation sees them & teaches them to reach out. It shows the guest that the are not considered an outsider here, but someone special and important. Great comment! I’ve seen that happen way too many times as well. Excellent point. This is something I point out elsewhere. When I do workshops, we talk about this frequently. The key to presenting any speech is preparation. Fear of giving a speech is a very common problem. One of my professors shared a story in one of my classes in college about a student who was very nervous before giving a presentation on a class assignment. This student had prepared for the speech, and the presentation in front of the class went very well. My advice to anyone having to give a welcome speech is to prepare thoroughly. Have you seen the bank TV commercial where a child asks a man about the ice cream cart, but the man says it is only for new people and then proceeds to offer a cone only to a second boy who enters the scene because he is newer? While staff and leaders should talk about welcoming guests or visitors, we need public terminology that continually seeks to integrate everyone into some new aspect of community. A congregation I had visited while on vacation made me wish I could return when they invited me to participate with them for Bible Study and stay for coffee and pastries. But treating me like a welcomed guest in worship, demonstrated that I was an outsider. On the other hand, growing congregations will have new and newer opportunities every week to which every participant might be invited. I have also been surprised by the number of regular attendees who are uncertain about procedures and other people in worship. This article demonstrates this uncertainty or newness even by longstanding members. Dawn I share your sentiments about referring to visitors as guests. But one of my pet peeve in church is this monotonous greeting: we would like to welcome our pastor, we would like to welcome our elders, we would like to welcome the choir, we would like to welcome our members……my thing is this; why would you be welcoming me back to my own home. I attend a small church of the christian faith and I really want to become more involved in my church. I would like to know how to give a quick and easy welcomimg approach to our brothers and sisters in christ as well as our guests, when we our invited to other churches for worship and praise services. I really want to please the lord and do the things of god so I just need some guidance on this thanks in advance ! how to write a welcome address in the church,and the theme for the event is HEARKEN UNTO HIM. Pls,help me out with it. what do you do when your greeter want to quite the team and we are a small church and really need them. Or could it be the the person over the ministry is not a good teacher or leader?? need help! Thanks for your question. I will be writing a forthcoming article on this question directly. . I have a few ideas. 1. Find out why they want to quit. In the past, I have quit my volunteer positions because I was underused, undervalued, or unskilled, or I simply didn’t see the point of my role. When it’s no fun, it’s a chore. Consider the reason the volunteer wants to quit. .. Find out the reason and see if it is one you can address. 2. Let them go Graciously. 3. Ask them to hang in there for a few more months while you find a replacement. Then really work at it finding their replacement to honor your committment. I have been privileged to give the welcome address at an anniversary celebration for a singing group at my church for many years. I usually try to make my speech interesting and a little unusual each time, This year I want to include a bible reference that is upbeat. Any suggestions? Well let visitors know that every church they enter is God’s house. God welcomes all his children to his house cause we are all brothers and sisters in Christ. We are all God’s children. God has a lot of church doors open. But we are glad Jesus sent you to this church house. And anytime this church door is open, we will welcome you with open arms and we will have a big smile on our face cause we are happy to see you. So just come on in every Sunday with your joy in your heart. Share it with us. Cause you are truly welcome to do so. I gain a lot of lessons in this message, I am graduate of International Institute of Evangelism, Ibadan,Nigeria.Thank God for this ministry, God will continue to bless you more in Jesus name amen. …the one who sows to please the Spirit, from the Spirit will reap eternal life. Let us not become weary in doing good, for at the proper time we will reap aharvest if we do not give up(Galatians5:8,9). Keep it on, God will reward you abundantly in Jesus name amen. good and well perfect ans for layperson/programmer or church secrtary. Addressing ways that guests can learn more about your church is a great idea. If don’t say anything then they won’t know where to look. It may help to have additional information listed on a program or some sort of pamphlet. Thanks Kendall for dropping by. One church we have been visiting welcomes guests from the front and gives clear instructions on filling out a connection card and putting it in the offering plate. They make it easy by providing pens at every seat, and a card at every seat. . It’s the clear instructions that help. Rick, I like that greeting. That says alot. It almost has the same feel as a benediction, but up at the front as a welcome blessing. Whenever à visitor enters you should be welcomed at the door by the ushers and at the end of the service you thank them for coming. If you prepare à meal, would you welcome the dîners at the table after they finish eating? You welcome before starting and thank after finishing. You thank the brethren for coming out also the ministers. @Lorna, Thanks for dropping by. . you make a great point about making the effort to thank visitors and members before they leave. . . I do with more church greeters and church ushers would help make that happen. Thanks for the insights in this page. They are very helpful and commendable. Comments and recommendations for welcome of guests at church very helpful. 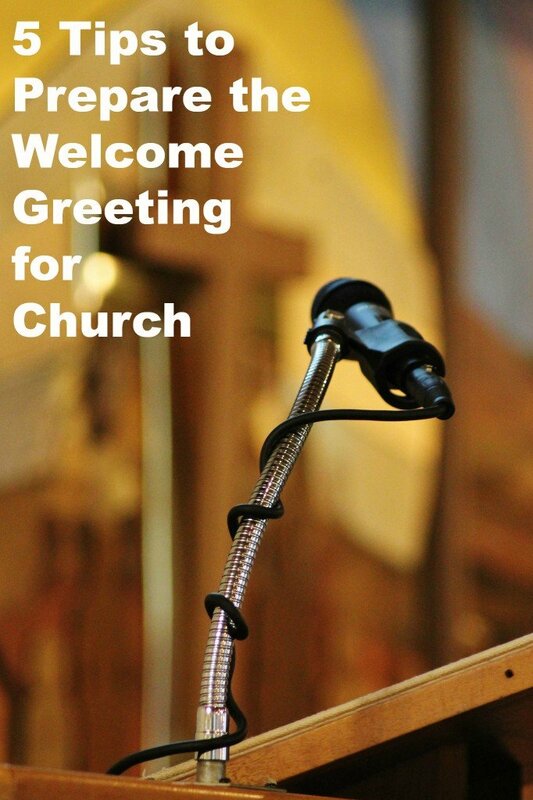 I am grateful to you for sharing some tips on how to prepare the welcome greeting for Church such as covering your visitor welcome speech with a prayer. One good way of celebrating the ministry and acknowledging your fellow parishioners is by leading a prayer that asks for the Lord’s guidance in everything we do. You may also want to ask for His continuous blessings and that may all his servants be guided according to His will. Thanks.